Over the past decades, securities firms and their analysts have been accused of producing overly optimistic research (e.g., stock recommendations) to attract and retain investment banking clients. To better protect consumers and restore trust in financial markets, European regulators decided to enact the Market Abuse Directive (MAD) in 2003. MAD introduced new rules limiting the relationship between research and investment banking departments, and created stringent disclosure requirements on the nature of such relationships (Directive 2003/125). In Regulating Conflicts of Interest: The Effect of Sanctions and Enforcement (RoF, 2014) Michel Dubois, Pascal Dumontier, and Laurent Frésard analyse the impact of the new European regulation on the nature and magnitude of conflicted equity research, and the role of sanctions and enforcement. They study a large sample of more than 250,000 analysts’ recommendations issued on stocks listed in thirteen European countries between 1997 and 2007. They tag as potentially exposed to conflicts those recommendations made by (an analyst working for) a broker on a firm for which it has acted as underwriter or adviser over the last twelve months (i.e., the exact provision of the European Directive). They report two central findings. First, the forced disclosure of potential conflicts appears quite effective. 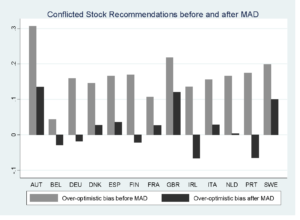 Whereas conflicted brokers issued recommendations that were significantly more optimistic than their peers in the pre-regulation period (e.g., less “strong sell” and more “strong buy”), the passage of MAD significantly attenuated the effect of conflicts of interest on equity research output. Second, the authors report large cross-country differences, both in the magnitude of the conflicted brokers’ recommendation bias in the pre-MAD period, and in the disciplining effect of the Directive (see figure). Further analyses reveal that cross-country differences stem from the substantial divergence in the severity of the legal sanctions (pecuniary, administrative, and criminal) applicable in cases of violations of MAD and the strength of their enforcement. Indeed, due to the absence of full legal harmonization across European countries, the enforcement of MAD’s provisions and the associated sanctions remain ultimately in the hands of national authorities. Hence, while the new rules apply equally in all Member States, the penalties and the actual enforcement vary across countries. After the passage of MAD, the over-optimism of conflicted brokers is virtually eliminated in countries equipped with severe sanctions (e.g. Ireland or France) but only decreased by around 70% in the countries where sanctions are milder (e.g. Scandinavian countries). Furthermore, the reduction of conflicted equity research is much larger in countries that allocate more resources to their financial supervisors (e.g., larger budget and staff). Overall, the efficacy of imposing new rules to tackle conflicts of interest appears to rest on the severity of sanctions in case of violations and the power with which regulators enforce the rules. The detailed analysis of the consequences of MAD underscores the need to distinguish clearly between new rules and their practical enforcement in the ongoing debate surrounding regulatory reforms plans and the efforts to harmonize financial regulations in Europe.